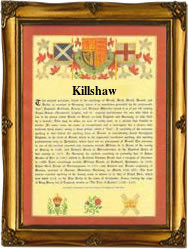 This name, with variant spellings Kil(l)shaw and Culshew, is of English locational origin from a place in the parish of Winwick, Lancashire, called Culcheth. Recorded as "Culchet" in the 1201 Pipe Rolls of that county, and as "Kulcheth" in the Assize Court Rolls of Lancashire, dated 1246. The name derives from the Old British words "cil" meaning a retreat, angle or corner, plus "coed", a wood. "British", in this case, refers to the extinct Celtic language of the ancient Britons. The surname is first recorded at the beginning of the 13th Century (see below). In his "History of Lancashire", Baine states that "The place (i.e. Culcheth) is called Kilsha by the common people"! On June 18th 1545, William Kilshaw and Jane Fish were married in Croston, and on January 22nd 1569, Alice Killshaw married Hugh Cooper in Ormskirk. Hugh son of Ralph Culshaw, was christened in Wigan, and on June 18th 1674, Elline Culshaw and Henry Walmsley were married in Preston. The first recorded spelling of the family name is shown to be that of Henry de Culchet, which was dated 1201, in the County Records of Lancashire", during the reign of King John, known as "Lackland", 1199 - 1216. Surnames became necessary when governments introduced personal taxation. In England this was known as Poll Tax. Throughout the centuries, surnames in every country have continued to "develop" often leading to astonishing variants of the original spelling.